Two years ago today, Mohammed Bouazizi set himself on fire in front of the government building in the town of Sidi Bouzid, Tunisia. His act of desperation set off a domino effect of protests against unemployment and the abuse of power that toppled dictator Zine El Abidine Ben Ali and started the Arab Spring. In short, yes. During Ben Ali’s era, religious citizens were looked on with suspicion. If you were a bearded man, or a veiled woman, you could expect trouble if you ran into the police. And to speak against the dictator was out of the question if you wished to avoid jail. Those things have changed now. Politics are discussed in restaurants, cafés, and right on the main downtown street of Habib Bourguiba, where people often stand in circles debating current affairs. Men with beards and veiled women are seen in almost every neighbourhood, and even niquabs are not uncommon. But there are those who would argue that the pendulum has swung too far the other way, and that now it is liberal secularists who get the heat for their opinions. During the Printemps des Arts exhibit, I interviewed Melek, a young rapper who participated in “Enti Essout”, a collaboration song that encouraged voters to participate in the October 2011 elections. He told me that he wished his group hadn’t taken part in the song. His disappointment in the government was palpable, but he was there to support his friend, graffitti artist Meen-One Calligraffiti, and so the conversation moved to other things. 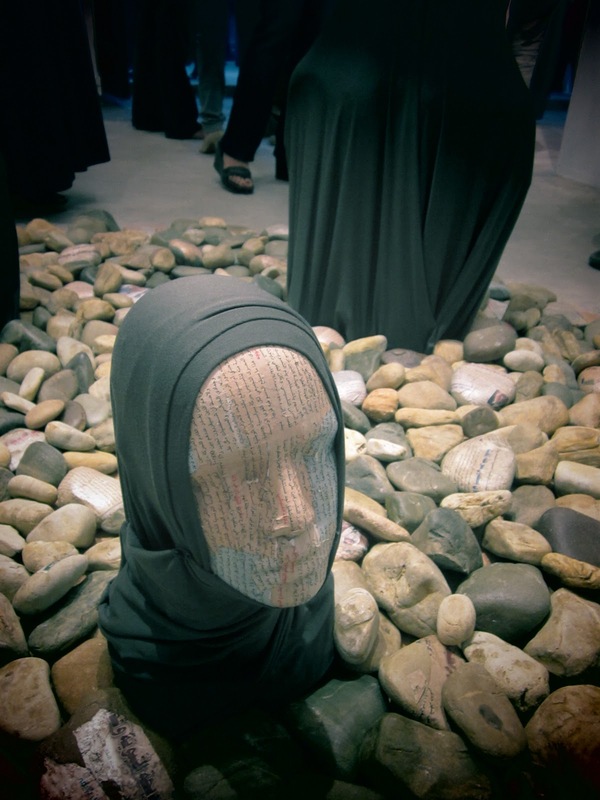 A week later, the exhibit was attacked after a religious zealot claimed that some of the pieces insulted Islam and the Prophet Mohamed. Facebook posts threatened the participating artists with death. Meen-One was one of those artists. 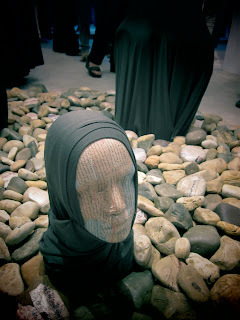 Instead of supporting the artists, the Minister of Culture was quoted as saying that some of the art was blasphemous, and was under investigation. I have spoken with bloggers and activists who claim to have been targeted by the police for their opinions. And of course, only a couple weeks ago, government supporters attacked the main labour union (the UGTT) on the anniversary of their founder’s death. At a protest soon after the attacks, I spoke to a young woman who is a UGTT supporter. She was shy, and I could barely hear her voice over the chanting, but she said quite firmly that Ennahdha “are terrorists”. This week a friend and I went out for lunch. She has worked in the Constituent Assembly, and I was interested to get her take on the current situation. “None of the politicians care about the Tunisian people,” she said. “They say they do, but they’re lying. I know. I was there in the sessions. I met them. I listened.” In June, my friend will not be voting. For someone as politically active as she, it is a powerful choice not to act. But she believes that none of the current political parties deserve her vote. And she is not alone. The youth who fought to change their country are underrepresented in government and the Constituent Assembly. Instead, the country is ruled by an older generation, many of whom were in exile for years and are believed to have lost touch with what Tunisia needs. And what about people like Bouazizi? Unemployment continues to rise, along with food prices and the cost of living. The towns in central Tunisia, including Sidi Bouzid, have experienced unrest this month as a result of the lack of change. Joblessness affects the educated and uneducated alike, and young people are the hardest hit. When I worked in an office on a busy downtown Tunis street, we watched police officers drive street vendors off the sidewalks on a weekly basis. And police brutality during protests has made it evident that the security forces are still in sore need of reform. I once had the great privilege of interviewing an Egyptian activist, who told me, “A revolution takes ten years.” He viewed the revolutions in his country and in Tunisia as a process, not the end goal. Citizens cannot simply sit back now that Ben Ali is gone and think that politicians will make things all better, no more than those who live in countries that have been democratic for decades can. They must continue to participate in government, in civil society, in making their voices heard and in making their country a better place. So no, perhaps Bouazizi would not be pleased with how little has changed for struggling Tunisians. But change takes time, and another eight years might be enough to make Tunisia a country he could be proud of.